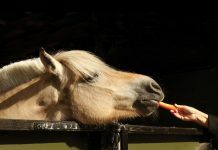 What if your horse’s response was so light that you could lead him by the hair of his chin? Teaching a horse to follow a feel at the slightest touch is not only impressive, it’s safe. Start with your horse in halter and lead line. 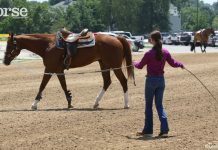 I use a Parelli rope halter and 12-foot lead rope to be most effective – stand in front, facing your horse. Stand far enough away so that he can see you and won’t run you over when he takes a few steps forward. Bring your “life” up (meaning put some energy in your body, have an intent in your mind) then lightly “comb” the lead rope toward you with open hands. “Combing” rather than pulling the lead rope gives you the lightest pressure, yet still teaches your horse to feel. Consistent pressure is the definition of the Porcupine Game (Game No. 2). The instant your horse even thinks forward, release and smile. Pat says that we need to move our horse’s mind first, then the nose, the neck and maybe the feet. So when you see your horse’s mind move forward, the release will teach him that he’s done the right thing. If your horse doesn’t think forward, increase the feel by slowly closing your hands on the lead rope, building the resistance until he thinks forward. Don’t PULL on the rope, simply hold firm and become a fence post, until his movement forward causes the release. If he gets nervous and backs up, try to maintain the pressure but drift with him – the instant he gets the idea to move forward, release and smile. After each release, start again at the lightest possible pressure – as gentle as you would be with a baby. Because horses learn to know “what happens before what happens happens,” he’ll figure out pretty quickly to move before you increase the pressure and make it uncomfortable. Once you have him “thinking” forward, ask him to shift his weight forward, then ask him to move his feet forward. Take the time to perfect these small steps and soon it will pay off. Ten minutes a day of this program and eventually your horse will lead by a thread! This technique really works, and it is so nice to be able to move my horses with only a hand under their jaw.